David poking fun at the “cheap” production values of the anniversary story is, of course, perfectly appropriate when viewed in the context of the show’s long-running (and richly deserved) reputation for wobbly sets and cut-rate visual effects because it’s a wink and nod to longtime fans who weathered the primitive years to get to the state-of-the-art version of the series we see now. However, as far as the cheapness of the production goes, one thing was always perfectly clear: Whether the producers had $1 or $10 to make a show in any given week, DOCTOR WHO was put together with more love than almost any other show on TV. 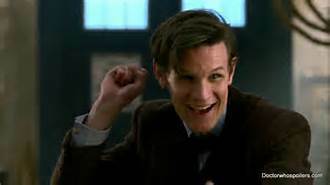 That love infuses every frame of the series, from the opening image of “An Unearthly Child” to the stuffed giant rat of “The Talons of Weng-Chiang” to the assembly of monsters in “The Pandorica Opens.” DOCTOR WHO has always been made with as much love as can be packed into the small screen. Luckily, our televisions are bigger on the inside, too.